In Australia there are several active opal mining fields, and potentially many more lying undiscovered. Opal is primarily mined in three states of Australia, South Australia, New South Wales, and Queensland. The main fields in South Australia are Coober Pedy, Andamooka, Mintabe and Lambina. 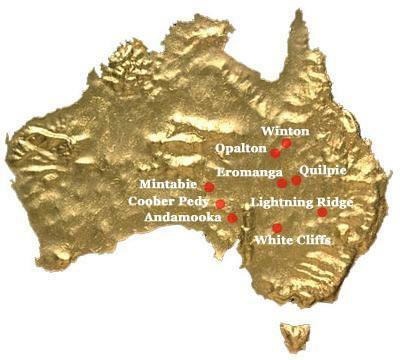 The main fields in New South Wales are Lightning Ridge and White Cliffs in the North West of the state. Mining fields in Queensland are spread over large areas of the state, the largest mine fields are in the Quilpie district. Within each state there are a number of mining areas and within each area there will be a number of fields. Each field produces different types of opal. Predominantly, South Australia produces light, New South Wales produces black and Queensland produces boulder. Smaller amounts of secondary types of opal are also produced in each field. The main opal type of each field has dictated the market structure.